The U.S. economy is strengthening but the Federal Reserve remains in cruise control. The Fed decided to once again reduce its monthly bond purchases by $10 billion, as expected. The central bank has been gradually reducing, or tapering, its monthly bond purchases since January. It will now buy just $25 billion a month. That's down from a peak of $85 billion when the Fed started its third round of quantitative easing, a policy dubbed QE3 on Wall Street. At this rate, the Fed will stop purchasing bonds this fall. Stocks rose immediately following the news but pulled back towards the end of the day. The 10-year Treasury yield ticked slightly higher. The next task ahead -- deciding when to raise interest rates -- still seems a long way off, and the Fed didn't give many hints. Instead, its top policymakers issued a statement that acknowledged inflation is nearing its sweet spot, but also cited ongoing weakness in the job market. Aside from those minor changes, the statement was nearly identical to other statements the Fed issued over the last few months. 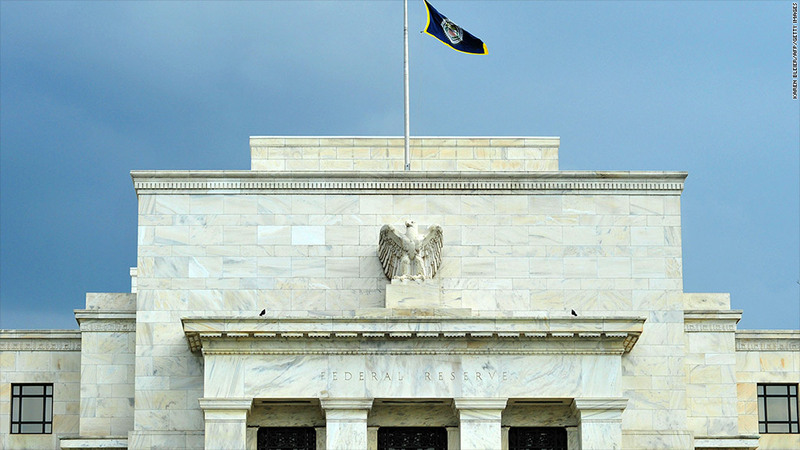 In addition to its bond purchases, the Fed has kept its short-term interest rate, the federal funds rate, near zero since 2008 in an effort to stimulate economic growth. When that rate is low, it translates into low rates for mortgages and other loans, thereby making it cheaper for consumers and business owners to borrow money. The Fed said in its statement that the federal funds rate will probably stay near zero for a "considerable time" after the bond purchases end. Most economists expect the Fed to raise its short-term interest in the middle of 2015, but Fed Chair Janet Yellen has made it clear that the decision depends on economic data. The government reported Wednesday that the economy bounced back in the spring, growing at a 4% annual rate in the second quarter. That follows a bleak start to the year, when the economy contracted at a 2.1% rate. Taken together with other data, the economy seems to be gaining momentum. Hiring has been strong, and when the Labor Department releases the July jobs report on Friday, economists surveyed by CNNMoney expect it will show another 230,000 jobs were added. Inflation still remains low too, giving Fed members some wiggle room to continue stimulating the economy, if they so choose. 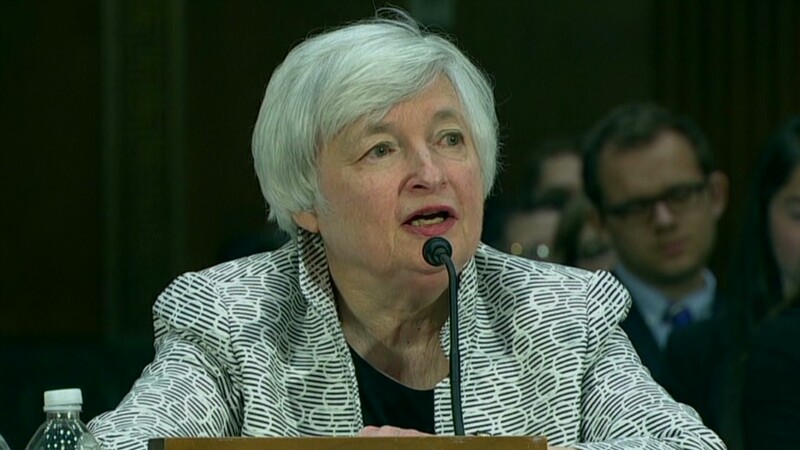 Yellen has said she wants to see wages rising more than enough to keep up with rising prices. So far, wages have been stagnant, even as the unemployment rate has fallen to 6.1%. "The centrists on the FOMC aren't going to abandon their view that there is still plenty of labor market slack until they see signs that wage growth is accelerating," said Paul Ashworth, chief U.S. economist for Capital Economics. "There are no such signs evident yet, but we expect that to be the big story in the second half of this year." Fed hawks: Start draining the punch bowl! Not all of Yellen's colleagues agree with her assessment of the job market, though. A few outspoken officials have been pushing the Fed to raise interest rates sooner, rather than later. Too much stimulus could fuel bubbles and trigger rapid inflation, they warn. One of those members, Philadelphia Fed President Charles Plosser, voted against the Fed's policy decision. He objected to the Fed's language on a future rate hike. He believes that language should acknowledge the considerable progress the economy has already made. Could Plosser win over more of his colleagues in the months ahead? "While Mr. Plosser is an outlier, his dissent today shows that there is increasing disagreement on the FOMC," said Jens Nordvig, head of fixed income research at Nomura. "As we get closer and closer to Fed targets, we are likely to trigger a change in Fed tone over the next 3 months."